Available in a variety of fabulous colors to help her pair and create her ensemble! These ankle strap wedges sandals are the perfect pair to add a few inches to her frame, elongate her legs and rock every dress, denim jean, or maxi with ease! Heel Height approximately 2.0" | True size to fit. Classic design that is sure to compliment every modern girl's wardrobe. Update her personal style with a touch of glam with these sensible mini wedge sandals by purchasing this pair of heels that will last for all memories! We love the wedge heel to give us the perfect boost in height and these are wearable all day long. Ultra lightweight design featuring a adjustable closure to perfectly hug her feet. Every outfit will be perfectly planned with these adorable shoes! We have so many colors to chose from! These go well with jeans, shorts, skirts, and her versatile for dressy or casual wear! 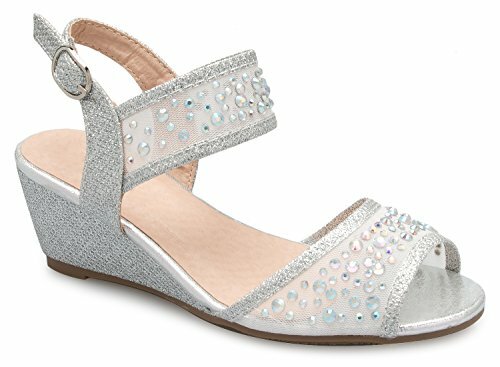 Featuring a cute strap with rhinestone that hug her ankle with easy adjustable buckle for custom support and provides a comfort throughout wear. Her feet will not slip, turn or move out of place while wearing these gorgeous heels!